Scanned from the Animedia 06/07 calendar by jensuki, posted with permission. Hopefully I'll be able to update this soon with my own scan. i loooove Host Club so much! great scan - Tamaki is <3! Ahahaa! This anime is great! XD Cute scan! What a CUTE image of Host Club! Kyaaa! Sugoi na~! 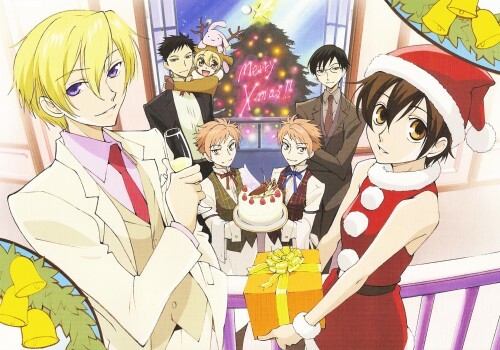 ouran host club is so cool! I really love this scan! It's so cute! It's nice,great...lovely,beautiful,I'm out of any ideas for words but I can say...IT"S EXTREMELY LOVELY!XD...In here Haruhi is sugoku kawaii!As Tamaki-senpai say,"Good!Good!Very good!" I was wondering when an xmas image would show up! Mori, especially, looks kinda different... really handsome! The twins are too small!